This is technical, but in a very different way. 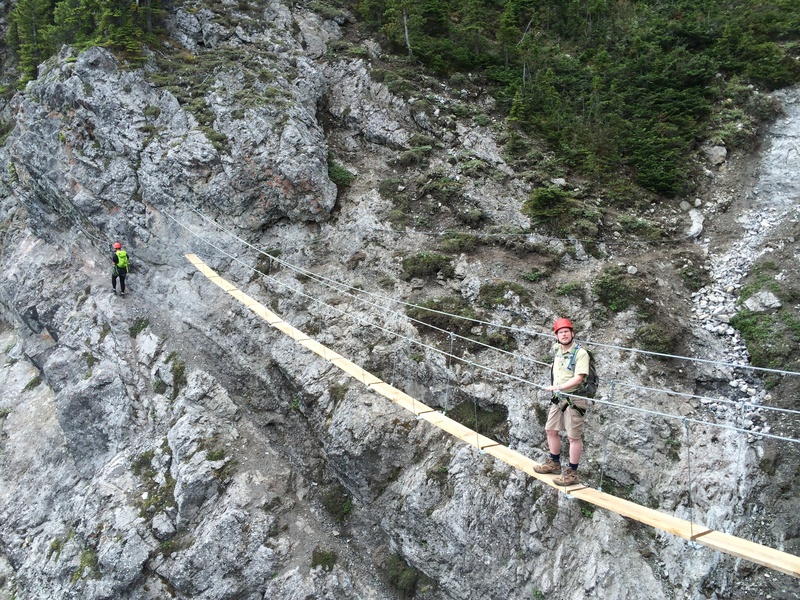 A while back in Switzerland I had a chance to do something called Via Ferrata. I knew what it was and wanted to do it, but I did something instead with my wife – hiking. So I was working away in Nashua a while back and I was talking with my wife about what were we going to do in the mountains the following weekend. 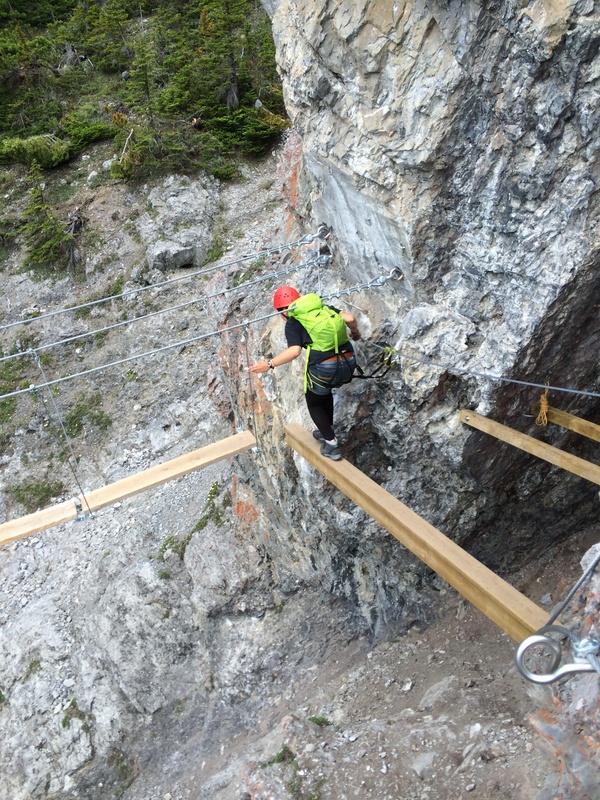 She mentioned she had booked me into a Via Ferrata that was almost in our backyard. Amazing. What a great wife! So this past weekend we were in the mountains and while she was in the spa I was on the mountain. 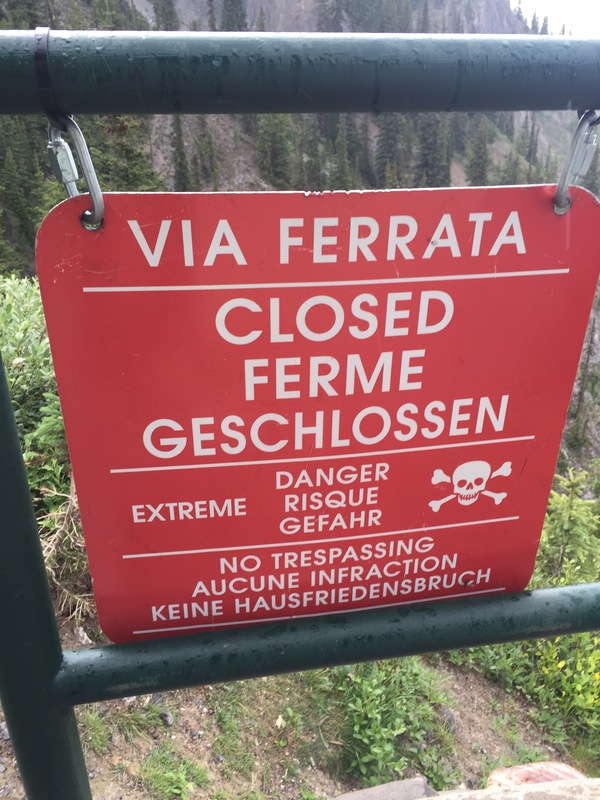 But I guess I should explain Via Ferrata – which means Iron Road. It was designed to get soldiers over the Alps in war, but also to get people in suits and dresses up the mountain to look around. So very historical but it is making a comeback and it is also reaching more parts of the world – not just Europe. It is pretty cool – going up what in the past I would have climbed, and yet doing it easier, safer and still very fun! If you ever get a chance to see what it is like I really strongly recommend it. If you get a chance to pick how long of a trip it is, take the long one! But below is some pictures of my trip from this past weekend. 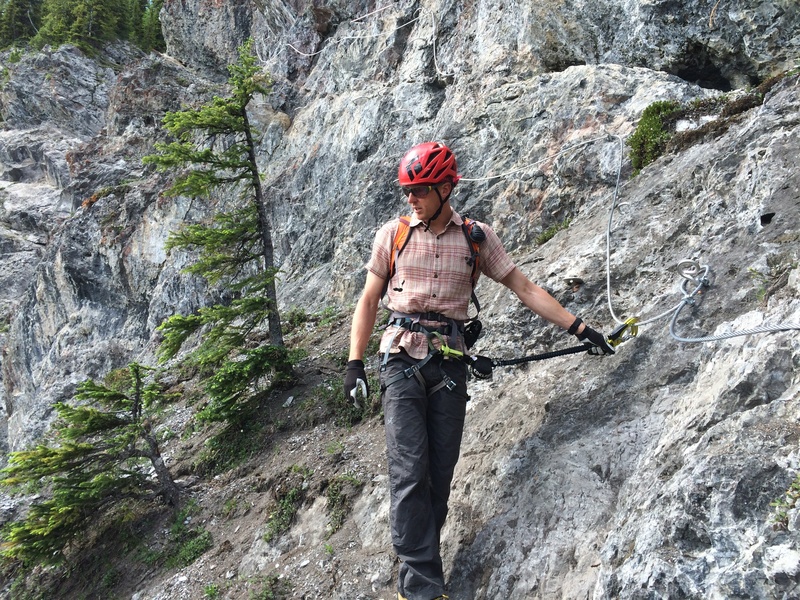 I went out with the folks from Mount Norquay and Adam was an excellent certified ACMG guide. There were six customers and it turned out very well! After a short drive from Banff, I was at the foot of a ski hill. After picking up gear, and a guide, we headed up the ski lift. So now we are pretty high (6900 feet) but there is a very nice Bistro at the top. I understand we will finish here in about four hours! 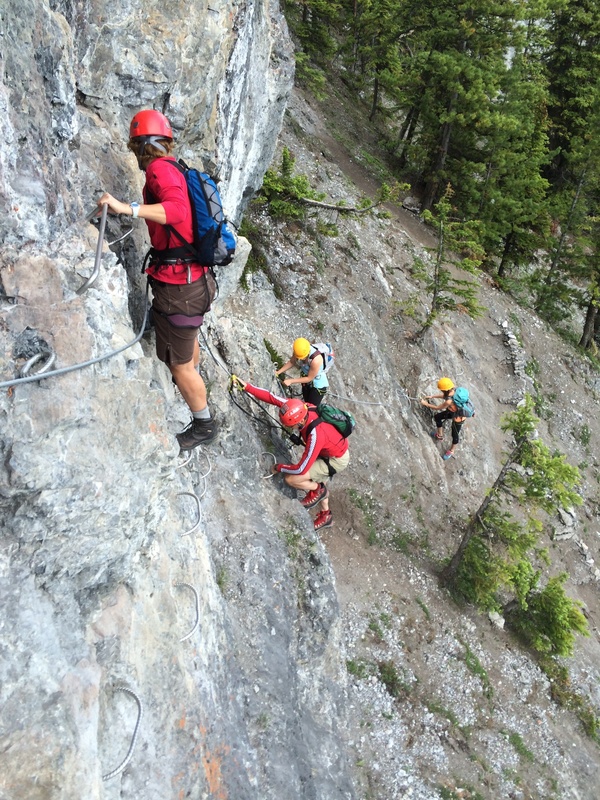 As we hike – for about 10 or 12 minutes I look up and see one of our fun things to do. 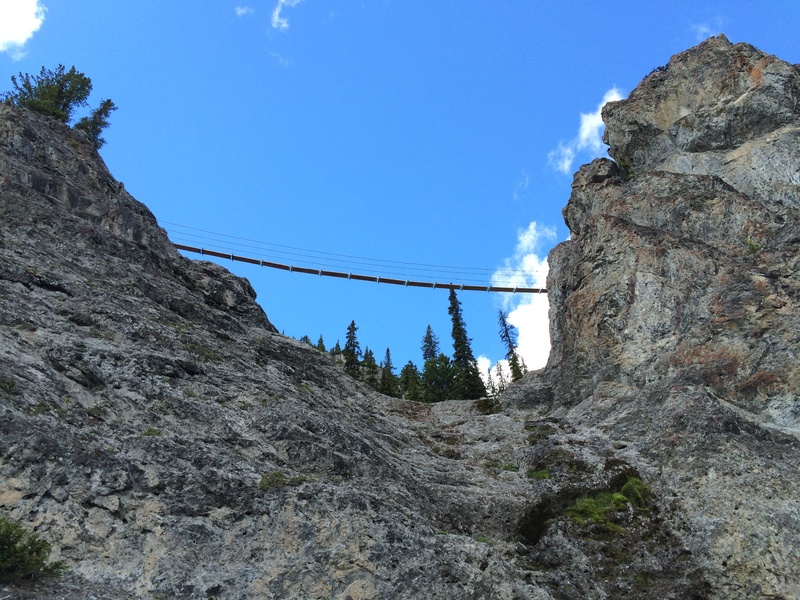 Wow – what a bridge! This is Adam, our guide looking at – I think – at the Cliff House Bistro and thinking of that new IPA beer they have! Notice the safety cable that you are always connected to? You are connected to it with two cables so that you can safely move from one cable to another and never NOT be secure – meaning you are always connected to something strong and safe. Notice also behind Adam the wire steps? Nice! Below you can see four people climbing up after me. Except not really climbing. 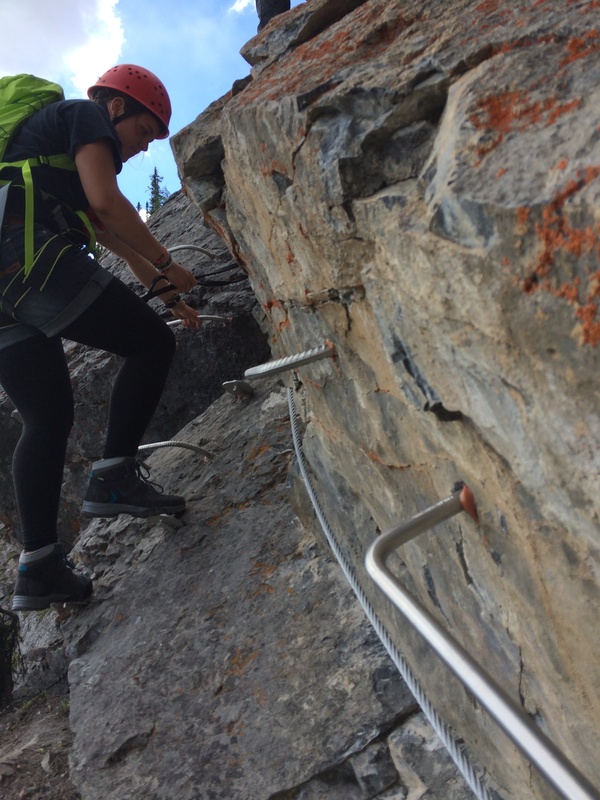 Big handholds called Towel Racks, nice footholds called steps and you are attached safely to a very strong cable and anchor. Next we get to see Maria heading up an almost vertical cliff. But she makes it look easy. Again you can see a lot of the hardware that makes this really a lot safer and easier. Now something even more fun. We need to deal with the balance beam to get to the bridge. Notice how the bridge looks a little smaller now we are closer? On my second trip this is a shot from the high point. 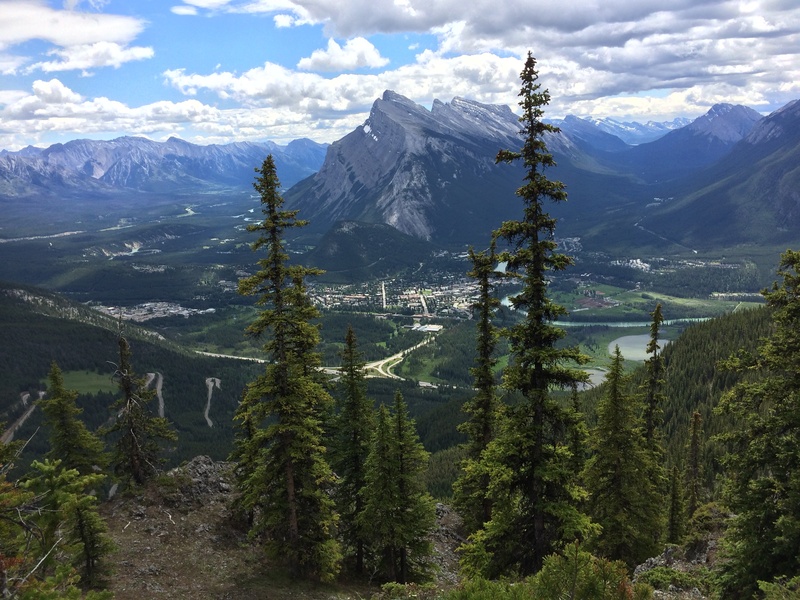 Check out the view of Banff from a point where we had a break. After this we headed back to the Cliff House Bistro. What a day! 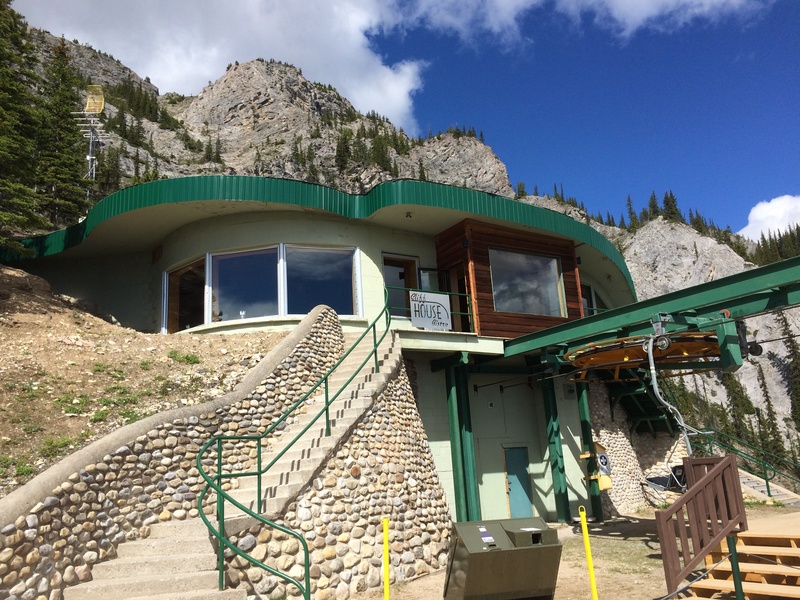 Much thanks to everyone and particularly our guide Adam and the team at Mt Norquay. I do recommend this trip quite strongly!! BTW, here is a nice review (with video) of this most excellent adventure. 7/11/15 – did the trip again, so added some pictures. This time brought some friends and it was wonderful. 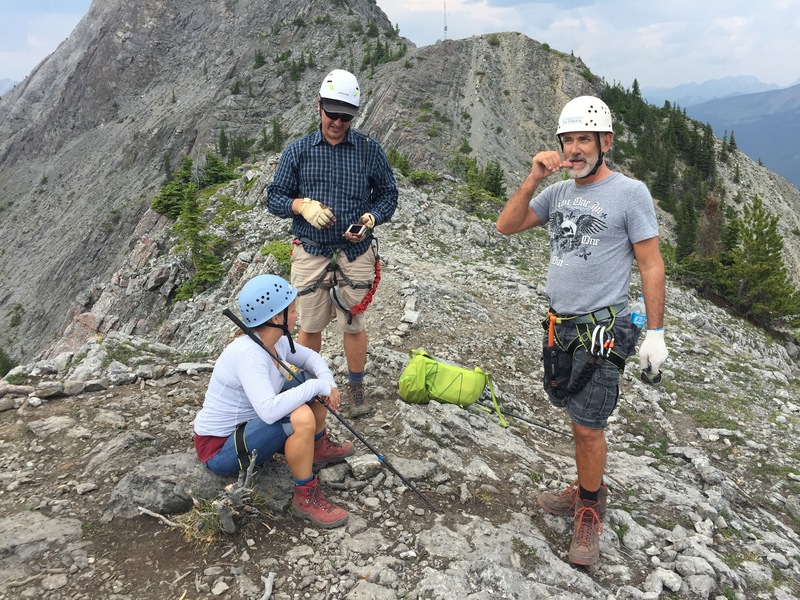 There was smoke in the air obscuring the views – but not our lungs – and we had a great guide too – Chris. Also my friends did not have decent boots so they were loaned very nice boots – at no extra cost! This makes two visits that were great. 8/10/14 – added the video link.